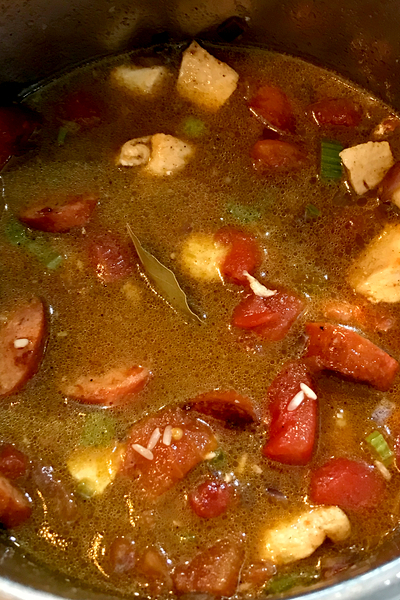 After I received my first Instant Pot, it took me a few months before I decided to transition one of my favorite recipes into Instant Pot Creole Jambalaya. For those of you that have an Instant Pot, you know what I mean. You have a favorite stove top or slow cooker recipe that your entire family loves. But you have no idea how to make it in the Instant Pot. Instant Pot Creole Jambalaya ready to eat. 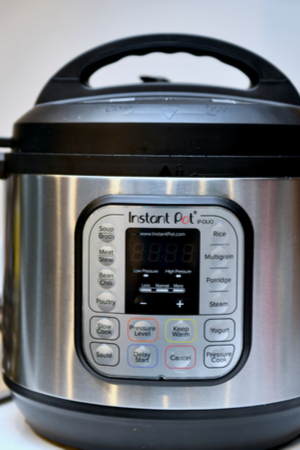 If you are unfamiliar with the Instant Pot Pressure Cooker, this multi-purpose device is a game changer in the kitchen. Not only is it a pressure cooker, but it can steam, sterilize, slow cook, make yogurt, rice, hard-boiled eggs, roast, make soups, and more! Seriously, if you haven’t checked out all of the recipes that we make with the Instant Pot 6 quart Duo, 8 quart, or our newest 3 quart mini, you have to take a look. It is a HUGE time saver for us in the kitchen. Recipes that take hours on the stove, oven or slow cooker can be made in the fraction of the time. The Instant Pot Pressure Cooker allows us to spend time with the family and not in the kitchen! And even when the recipe takes the same amount of time to prepare, I am able to walk away and get other chores done while dinner is cooking. Plus, the taste is soooooooo much better. Is it obvious that I love my Instant Pots???? Can you make your favorite recipe in the Instant Pot? I wish I could give you a definite YES, but the true answer is maybe. It all depends on how the recipe is written. You see, there are a few things that are necessary to make the Instant Pot pressurize. Season the shrimp with creole seasoning for extra flavor. Instead of getting in all of the details in this article, see: Instant Pot Tips For Beginners. This will help explain the basics of using an Instant Pot. So when it was my turn to attempt to make Instant Pot Creole Jambalaya I was a little nervous. Would the pot come to pressure? Am I going to get the dreaded BURN notice? Would it taste just as good? These were all the questions that were running through my head. 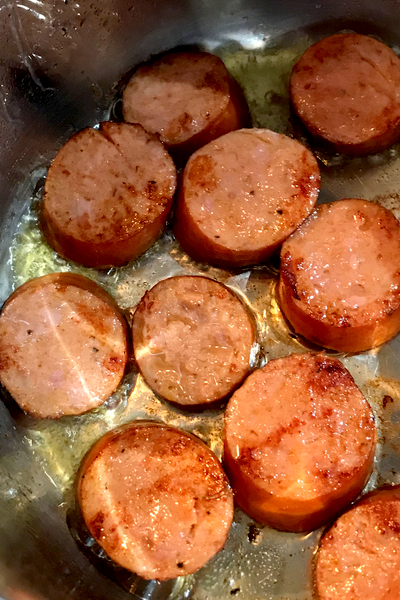 Smoked andouille sausage browned in the Instant Pot. The first step in cooking Instant Pot Creole Jambalaya is to brown the meat. We prefer to use the trio of shrimp, andouille sausage, and chicken thighs for this recipe. 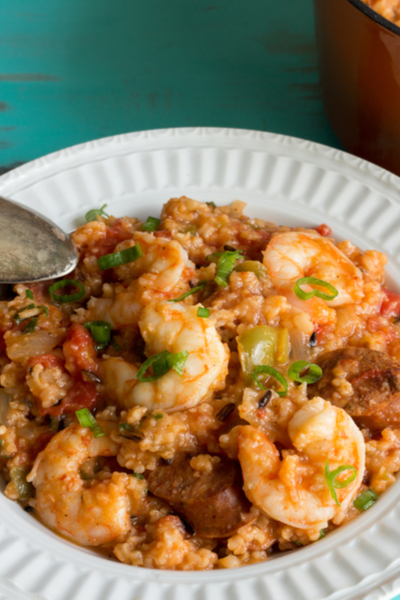 These flavors compliment and blend together perfectly to give you that classic jambalaya flavor. The key to sauteing in the Instant Pot is to make sure that the display reads HOT before you add the oil. This will prevent the meat from sticking to the bottom of the pot. Another important step that you can not skip is to deglaze the liner of the pot once you are finished sauteing the vegetables. 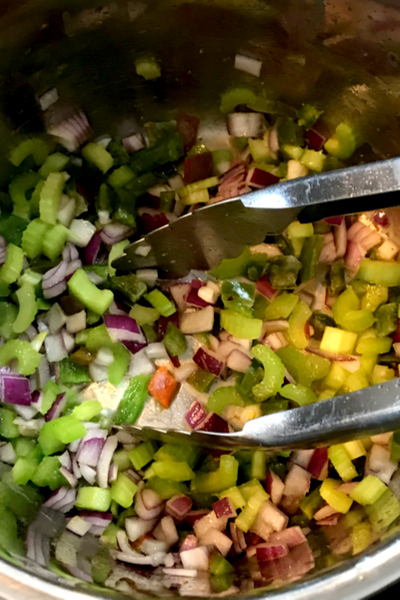 The holy trinity of celery, onions and green peppers sauteing in the Instant Pot. If there are any stuck bits to the bottom of the pot, you will surely get the BURN notice during the pressure cooking process. Simply use a flat wooden spatula and scrape the bottom of the pot with the liquid from the vegetables. If there isn’t enough liquid, add in a little of the broth. It only takes minutes to deglaze and it will prevent a huge headache for you later. Finally, be sure to rinse your rice before adding it to your recipe. Pour your dry rice in a fine mesh colander and rinse until the water below comes out clear. This process takes approximately 3-4 minutes. Use your hand to move the rice around so every grain can be exposed to the running water. 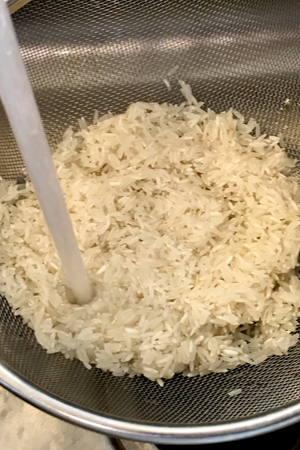 The rinsing process helps remove the starch and your rice will come out light and fluffy. If you follow these simple tips, you will have a New Orleans classic recipe ready to eat in just 30 minutes! Instant Pot Cajun Jambalaya ready to be cooked. Instant Pot Creole Jambalaya for the win!! And if you love this recipe check out our dump and go Instant Pot Shrimp Boil recipe! 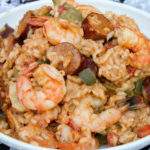 Delicious Cajun shrimp, sausage, and chicken jambalaya made in minutes in the Instant Pot. 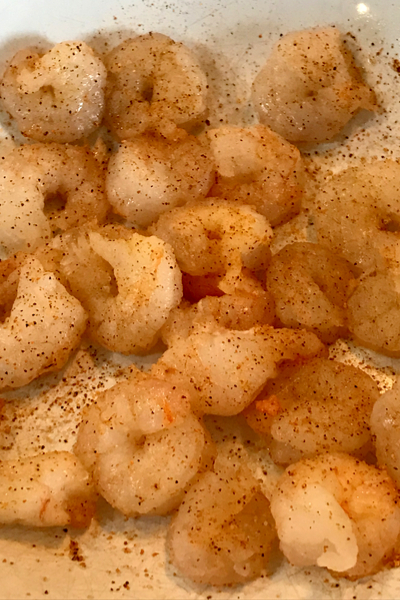 Coat shrimp with 1 teaspoon of Creole seasoning and set aside. On the Instant Pot press sauté and add when display reads HOT, add oil to inner pot. Add andouille sausage and cook on both sides until browned. Remove and set aside. Add chicken and cook until browned on both sides. Remove and set aside. Add shrimp and briefly sauté for just a few seconds, adding a teaspoon of oil if needed. Remove and set aside. Add onions, bell pepper, celery, and garlic. Sauté until onion is soft and translucent, stirring and deglazing the pot as the vegetables cook. Add a few tablespoons of stock to the liner of the Instant Pot and deglaze the bottom. Hit Cancel Button. Add thyme, the remaining Creole seasoning, salt, rice and stir to coat. Stir in tomatoes, Worcestershire, chicken broth and bay leaves. And stir in the reserved sausage and chicken. Lock lid in place and place valve to the sealing position. Pressure Cook/Manual on High Pressure for 7 minutes. Once the cook time expires carefully perform a Quick Pressure Release and slowly open the Instant Pot lid. Stir in shrimp. Replace the lid to the Instant Pot with the valve in the venting position, and allow the shrimp to finish cooking in the Keep Warm heat for 10 minutes. Open the Instant Pot and add parsley and stir. Garnish with green onions and additional parsley (optional).